Summary: Miami Exotic Car Rental is a Miami luxury vehicle rental service that revolutionizes its niche. With its largest selection of exclusive cars in the country, the service welcomes everyone who wants to enjoy a truly memorable ride. Despite the economic instability, the luxury car rental business holds strong today. The industry is steadily growing and experts predict it to reach $23.2 billion by 2022. Compared to $8.6 billion in 2014, that’s a huge leap that proves the business does have a bright future. It’s made all the brighter for the residents and guests of Miami, the leading tourist destination in the US. From now on, every person there can enjoy a ride in an exclusive luxury vehicle that’ll fit any taste. Miami Exotic Car Rental, a rental service that recently started its operation, offers the largest selection of the most incredible vehicles in the world. The list of available car brands is a balm to the soul of any car-junkie as the company offers anything from Lamborghini and Bugatti to Aston Martin and Bentley. This fine selection of exotic luxury car rental in Miami is available at http://miamiexoticcarrental.com. The website also allows one to check the vehicle’s availability immediately. Luxury Exotic Car Rental Miami Finest Selection & Service: Is Miami Exotic Car Rental for Real? The 214.4% of the yearly industry growth means that new rental companies appear all the time. The level of competition in this niche is huge, so one has to do something really drastic to stand out. 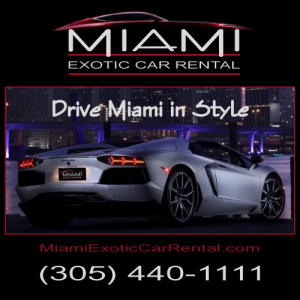 Miami Exotic Car Rental chose two of the most customer-friendly features to focus on. The service’s title as the holder of the most versatile exclusive car fleet immediately draws attention. It promises to provide some of the rarest models, which are difficult to find and even harder to hire because these cars usually have a huge waiting list. The other advantage of this company is that its exotic car rental Miami hourly rates are rather reasonable. The huge fleet comes in handy here as well because it contains more affordable options as well as some of the most expensive vehicles on the planet. Their thorough focus on versatility and affordability makes Miami Exotic Car Rental stand out among the dozens of luxury car rentals operating in Miami. One can easily verify the reliability of this rental and their rates by visiting the company’s website. The customer service is on par with the vehicles in the company’s fleet. As Miami Exotic Car Rental is used to working with international tourists, they offer assistance in procuring a license necessary for driving in the state of Florida.